It’s almost time to throw away the comfort food and get ready for Spring and Summer with light and healthy dishes. Here is a combination of both that will leave you feeling satisfied and healthy at the same time! Lobster Pot Pie Pie Crust: Use our whole wheat pie crust recipe Filling: Use our veggie pot pie recipe, just replace the potatoes with as much lobster as you want! 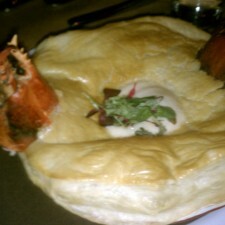 Stick the lobster parts poking out of the pie crust for visual appeal and Enjoy!